Tipsy? Or Tiny? | Y'all Behave! Nick Swardson had it more right than he knows! (click here for comedy clip) After watching his standup, I got to thinking about the surprisingly accurate comparison between babies and borachos. 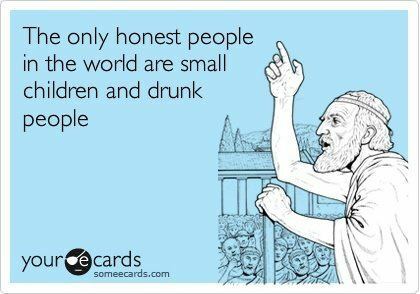 First off, both kiddos and drunkards think they are amazing singers and dancers. I witness the same overconfidence of busting sweet, sweet dance moves on a day with Boss Lady or Rebel, as I did on a night out with my gal pals in college, and Mr. Man and Big Cat belt out Johnny Cash with the same aplomb as myself after a few cocktails at a karaoke bar. Why is this self-assured air, so inherent in our early years, only achievable by liquid courage later in life? Whatever the reason, the similarities between the tipsy and the tots continue, with similar behaviors in the emotional department as well. Tykes go from happy, to sad, to mad, to confused, to lovey-dovey, all in the matter of ten minutes, much like the full spectrum of emotions can wash over an adult overwhelmed by deceptively potent margaritas- one minute a gal pal will be mad at her boyfriend for not texting her back, one drink later she’s sobbing how much she loves him. The more things change, the more things stay the same! The act of drinking is comparable as well. One time Boss Lady, after a song wound down during one of our dance parties, ran over to her bottle, grabbed it, chugged her milk, threw her empty bottle across the room, wiped the back of her hand across her mouth, and hopped right back into the dance party. “Wow, Boss Lady, you’re like Miss Cheryl sophomore year of college,” I mused, impressed. My cousin Mike had the same habit of chunking bottles, though in his case, the habit was a tad expensive. My Aunt Carmen had noticed that after being in the car, Mike’s bottles were always missing. So during one car ride she watched him closely in the rearview and caught him in the act of finishing the bottle, then tossing it out the car window! Haha! Just as so many under the influence liberate who knows how much litter out of moving vehicles. Lowered inhibitions are natural to children, especially when they are too young to have developed a frame of reference for acceptable behavior. They burp, they blurt out inappropriate words at even more unfortunate times, they’re touchy-feely, they raise their voices, they cause scenes, and so do the fully-grown, when buzzed. At times when a kiddo stumbles or hiccups I ask, “Have you been drinking? It’s a little early!” Besides baring bodily functions to the masses, the tendency to disrobe is often observed. The art of undress is far less burlesque, and much more Bare Naked Babies, with children peeling down no matter the setting or audience. I, myself was guilty of this particular proclivity for risqué turns and on a home video- meant to showcase my, at the time baby, brother Buddy, i was supposed to be playing quietly back in my room- I hop out of the hallway, run up to my mama with a mischievous grin, lift up my dress, and suggest as coyly as a 4 year-old can, “Let’s take off my clothes and see if I’n…and see if I’n nekkid!” I’d like to say this was a childhood flash in the pan, (pun intended) but after multiple post-poolside cocktail moonings of roommates(sorry Trish), and a late night, post-graduation(not even mine) semi-streak through the Texas State campus(also with Trish), I think that I’ve come full circle, though not fully clothed. Because of the irrefutable similarities between the very young and the very hammered , often times it’s best to deal with children just as you would a friend who’s three sheets to the wind: listen to them even if they repeat themselves over and over again, put on their favorite song, hold them up when they can’t walk straight, and always tell them they will feel better tomorrow. Yes! I have been waiting for this post!! You know how I feel about Rebel and his similarities to a drunk adult. Watching him weave and wobble around and becoming overly affectionate with any human being around is one of my favorite things. Right you are, Happy and you’ll notice i’ve augmented the post to include your all-time Cheryl story! Cheryl – I laughed out loud at this one! You have a great way with words! Lol, I love it! Great post! And I especially love that you didn’t assign an alias to Trish, ahahaha! Luh you!